The Orchard video, shot among the orchard’s fruit-bearing trees, shows a small water basin dug in the ground. 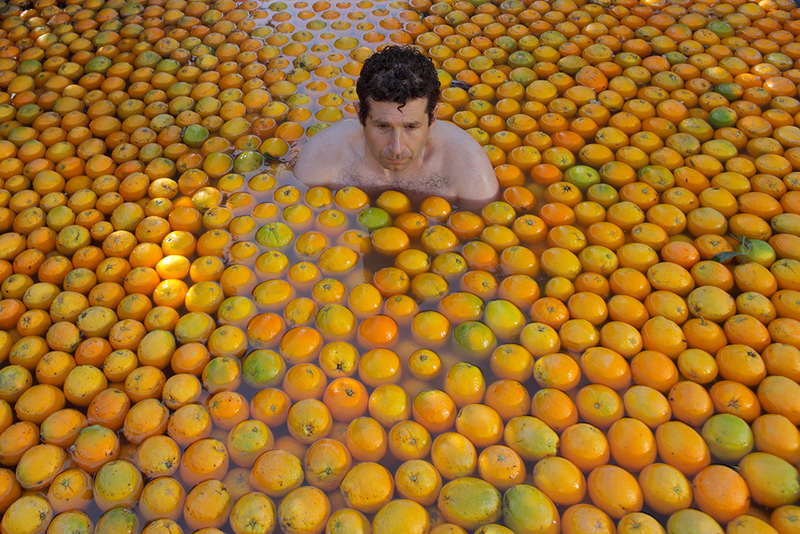 Marcus is seen standing neck-high in the pond, with only his head popping out from the water, whose surface is filled with floating oranges. Thus submerged in the water and surrounded by citrus fruit, he begins to chant It’s All Gold, a famous song from the Israeli repertoire, originally performed by the group Ha’tarnegolim. Indeed, in still images of The Orchard Pond the scene is depicted as a bright vision basking in wintery sun: Seen here in an aerial view, Marcus’s head seems like a dark protrusion floating amidst the citrus fruits in orange and green. His utopian pool is surrounded by a variety of fruit-bearing trees – oranges, grapefruits, lemons and pomelo fruits, all freshly washed by the recent rainstorms of December . Yet this ravishing sight merely heightens the anachronism inherent in the scene: The restored orchard is but a relic of what was once a prosperous economical branch, a material culture and a way of life that are no longer viable – while Marcus himself, thus immersed in the water, among the fruit, rather recalls an obscure ritualistic undertaking or a curious still life arrangement.